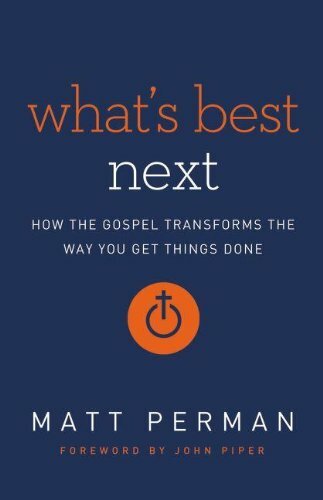 If you read only one book this year*, it should be What’s Best Next: How the Gospel Transforms the Way You Get Things Done by Matt Perman. Yes I mean that. The aim of the book is “to reshape the way you think about productivity and then present a practical approach to help you become more effective in your life with less stress and frustration, whatever you are doing.” And the book delivers. Stop everything and read it. If you read this book, and put into practice the things contained within, you’ll be able to get to other books on your list, and all the other things you put off to make space for reading this book and putting into practice the habits he suggests, and a bunch of other things as well. How do I know? Because it works for me. In 2009, I interviewed for (and eventually accepted) a position as Sr. Web Manager for Desiring God Ministries. Matt P was at the interview. He noted that I was into “GTD” by David Allen, productivity tactics, and tools. He said he was too (understatement of the year.) I was not familiar with Matt or his blog at that point, but long story short, as much as I was “into it”, I came to find out I was only dabbling. Matt took me to school and changed the way I worked. I came to this book with a similar attitude of thinking that I was pretty well versed in GTD. Matt and I have spent the last 5 years discussing GTD and I am very very familiar with his thinking on it. I didn’t expect to learn much. But there is something about the presentation of the concepts in this book that was enlightening. Perhaps its simply the orderly and concentrated reminder of the concepts, but the explicit rooting of GTD concepts in Biblical Theology (and it is not flimsy proof texting, as with most “Christian” business and leadership type books!) is, to borrow a word, edifying. I am renewed in my passionate pursuit of good works, for the glory of God! Matt notices (as have I) that “productivity” is often poo-pooed by Christian leaders as somehow “unspiritual”. That rest, retreat, and slowness to life are somehow more spiritual. There is a dangerous dualism here that not only ignores the testimony of scripture, but actually results in a failure to LOVE. This perhaps stems from a bad definition of productivity. Matt does an excellent job of reframing productivity in Biblical terms. The primary goal of productivity is love. Productivity is about effectiveness, not efficiency. And productivity is about doing the right things. It is possible to effectively and efficiently do the wrong things, which is not productive! So, God cares about productivity, because productivity is about effectively loving people. Throughout the book, Matt does an excellent job of unpacking the scriptures to show how intrinsically the concept of productivity is woven in throughout the entire scriptures. It’s easy to miss because it is everywhere. The book helps unpack what the knowledge era is, and what tactics are necessary in this new era. And he is right. The answer is because it’s not simply knowing the core principle, but doing it. Matt lays out a very helpful set of structures for developing the skill of knowing what is most important, and then doing it. They are encapsulated by the acronym DARE: Define, Architect, Reduce, Execute. I was most helped by the reduce section. Define, Architect, and Execute are things I’ve been practicing for the last several years using my systems. Knowing how to reduce has been the biggest challenge, and is the one I currently face. The thing about the way Matt lays out the “reduce” section is that it’s not simply about saying “no”, though this is a key component. Matt gives us a structure for reducing our task list, while effectively increasing our productivity. He does this through another memorable acronym DEAD: delegate, eliminate, automate, defer. And he gives us helpful strategies for each. Matt’s biggest struggle in writing this book was condensing the wealth of knowledge and insight he has into this area into a single, standard-size, book. The result is that there are a ton of hidden gems and unexpected nuggets throughout the book. This is not a quick read. But it is entirely worth the investment. Get a copy right now. ALSO: I’m giving away two copies, get your hands on one! * Yes, yes, of course I mean apart from the Bible.